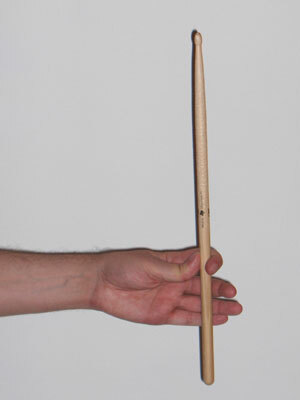 "Strokes dissociation" or "hitting gestures" is to use only one joint to move the stick or drumset pedal. This vanguard technique was developed with the beginnings of jazz and modern drumset, not only to gain better control and greater efficiency (less tiring) but also to relax some muscles while others work alternating different separated strokes (see in particular the lesson "Hits alternating"). 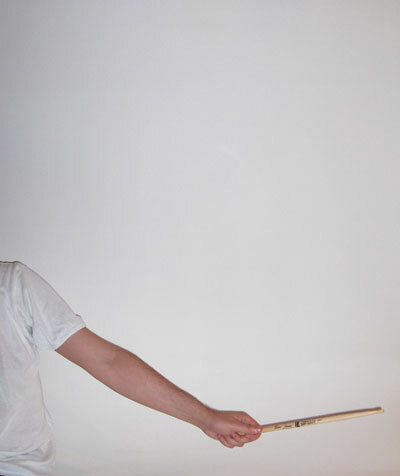 Each stroke implies different use and power, which can expand the dynamics range (from pianissimo to fortissimo) for better control (one hand roll, accents) to optimize postures (each instrument of the drumset being in a different place) and make more ergonomic the passages and rolls (shoulders or elbows to move from one instrument to another, wrists or fingers for the rolls on the same instrument). Note that to isolate the movement by a single joint, you must lock all others, that is to say, doing a contraction of antagonistic muscles (example: locking the elbow by the equivalent contraction of the triceps and biceps of the upper arm). Finally, to practice, perform the movements described first very slowly, taking aware of the posture of the body. Outstretched arm, tight strongly the stick, elbow, wrist and fingers locked (or almost). It is the most powerful strike and tiring for the arm, to be used with the utmost parsimony (also to promote the contrast and preserve the ears). Work also the passages very slowly from one instrument to the other in extreme distances, where this large gesture is necessary (eg the snare drum to the crash cymbals, hi-hat to the ride cymbal or floor tom, etc.). The shoulder is the only joint of the arm with hemispherical head, which means easy access to all directions. In any event, you must have access to all instruments without pivoting back (or only exceptionally), which would be very damaging in the long run (see "Posture" and "Injuries"). The upper arm should be held along the bust, glued and parallel, as at rest. Learn to relax muscles not used and not expose them to unnecessary weight pressure (which would be the case if you raise your elbows here). Wrists, fingers and shoulders are locked here. 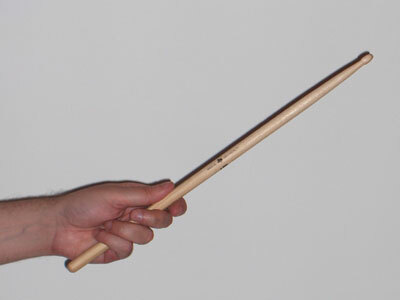 This strike is useful to give power (examples: rim-shot or accents or crescendo) or to pass on instruments adjacent to snare (tom, ride cymbal, hi-hat, small toms suspended above the bass drum, etc.). The elbow and shoulder are locked in the position that provides the best location for the wrist hit only, implying different angles depending on the instruments hitted. 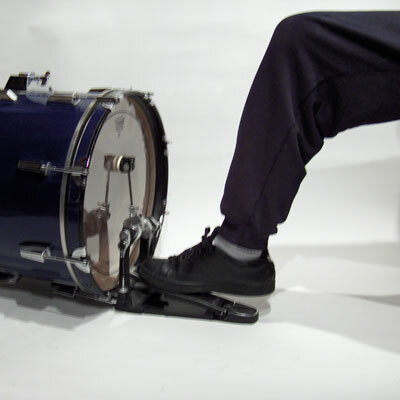 The closer you get to 180 °, the less is it tiring, because of the weight, but the position of the knees usually requires an angle of the elbow at least equal to 90 °, even for the snare (instrument best placed and most played). Use the shoulder as a last resort (crash, dome of ride, etc.) because it induces fatigue (entire lift of the arm). 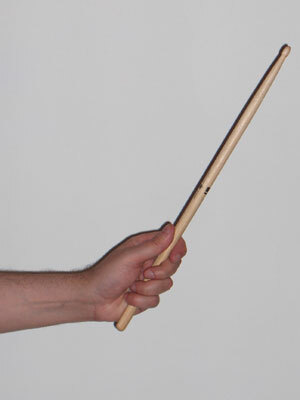 Fingers grip the drumstick again (like a hammer), but a position palm facing the ground is more ergonomic for this stroke, unlike any other, where the palm should be placed vertically (thumb along the shaft of the stick). The "pinch" must be as free as possible here, with the second phalanx of the thumb and forefinger. Practice first with movements of the thumb and index finger alone, then add each other finger separately, and finally all the fingers at the same time (some drummers, alternate each finger, like a pianist or a flamenco guitarist). 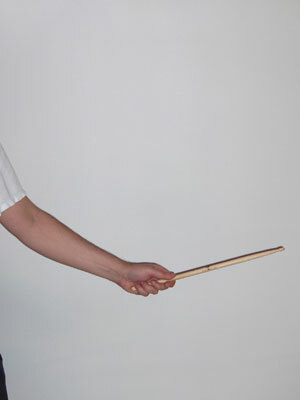 Optimize the use of the rebound, giving just a synchronous fingers pulse allowing the stick to go down (hit), and moving the stick only in a perfectly vertical plane. The rebound will be enough to let the stick going up (lift). Finally, pinch your stick on the "ideal bounce point". 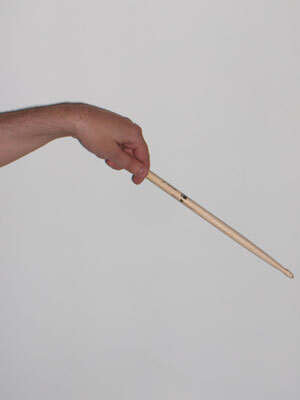 This point is different for each drumstick because of the differences in density and shape of each model. This is why I advise to quickly choose a model of drumstick, to not disrupt the acquisition of reflexes (to test by leaving bounce the stick balanced on the index only). This stroke is the most difficult to master, and can not allow to change easily position (except with a joint movement of other joints, hence the need to work with all joints). On the opposite it allows a high velocity and endurance. 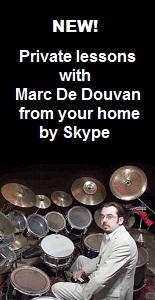 Terry Bozzio, Vinnie Colaiuta, Dave Weckl and Dennis Chambers are masters of this technique, in the tradition of classic jazz drummers (Gene Krupa, "Papa" Jo Jones, Louie Bellson, Buddy Rich, Art Blakey, Max Roach, etc.). Toe tense (continuous contraction of the calf), lifting the whole leg. The most powerful stroke ("kick") and the most tiring. 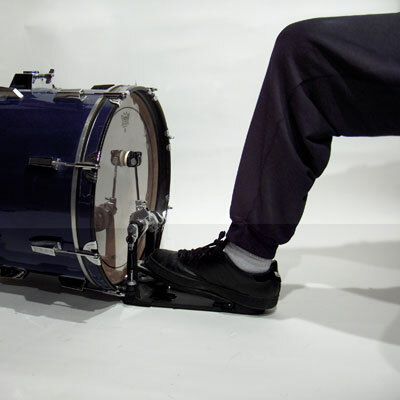 Some drummers even use it with double pedal (athletic!) as Mike Terrana or Horacio Hernandez. 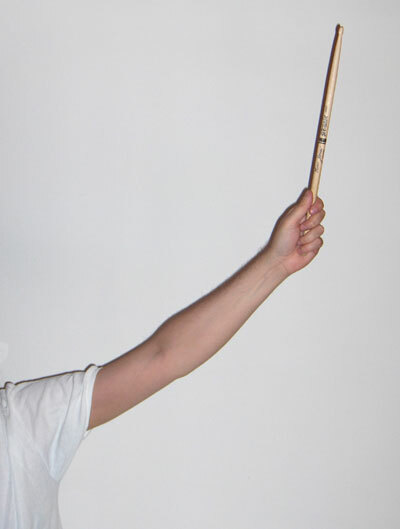 It is very useful for playing the hi-hat ("chick") quickly without making saturate the cymbals sound ("crash"). 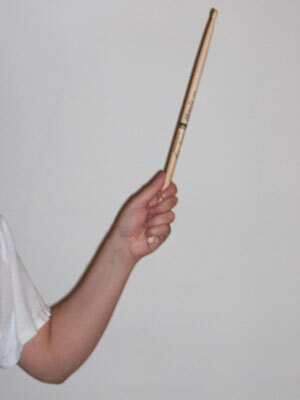 This stroke is widely used by vanguard jazz drummers as Tony Williams, Jack de Johnette or Dave Weckl, because it gives the illusion of a continuous chabada while using both hands on the drums (for solos especially). The heel never lifts up from the ground here, and the leg is then always rested and immobile. This is a hit which allows endurance and especially "fineness" of dynamics and velocity, much appreciated by jazz musicians. Personally, I also used it with double pedal, which is quite uncommon, because rarely used in "soft" context (I use it for samba for example, and to play rudiments with hands and feet during solos). Some drummers also use the heel stroke, toe down, to mark the silences, note rests (it's the case of Max Roach with the left foot on the hi-hat pedal). NB: all these strokes must be mastered before starting to work their alternation, which is the subject of another lesson: "Hits alternating" (play heel-toe, or finger-wrist ("one hand" roll), or wrist-arm (well known as "Moeller technique") for examples).